The Pew Environment Group has conducted a gap analysis comparing the port State measures (PSMs) established by 10 Regional Fisheries Management Organisations (RFMOs) with those established by the United Nations Food and Agriculture Organization (FAO) Agreement on Port State Measures to Prevent, Deter and Eliminate Illegal, Unreported and Unregulated Fishing (PSMA, or Agreement). The research assessed the extent to which measures adopted by these RFMOs meet the PSMA standards, and identified those aspects that need to be further developed by each RFMO in order for its measures to become aligned with the Agreement's. The newly adopted PSMA sets an international minimum standard on PSMs and provides a unique opportunity to harmonise and strengthen port State controls globally. RFMOs have a special role to play in this process, specifically in helping to combat illegal, unreported and unregulated (IUU) fishing on the high seas. 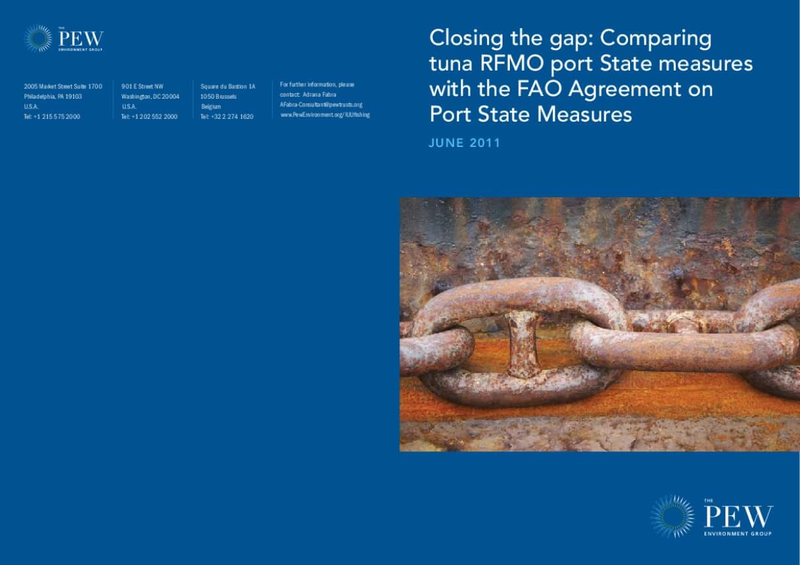 This report presents the final results of the gap analysis research conducted for the five tuna RFMOs based on information that was publicly available up to 30 April 2011. As part of our methodology, we shared the preliminary results of each RFMO gap analysis with the Secretariats of all 10 RFMOs and, through them, also with their Contracting Parties (CPs). We would like to thank those RFMO Secretariats and CPs that provided us with comments, many of which were extensive. We have taken all the comments received into consideration and revised our preliminary analyses where necessary. The analysis focused on a single set of tools available to combat IUU fishing, namely PSMs adopted by RFMOs, and did not examine other measures adopted by governments or any of the reviewed RFMOs, such as flag State controls or market measures not taken at port. Our assessment of the degree of conformity between each RFMO's PSMs and the PSMA does not reflect the overall performance of that RFMO in its efforts to combat IUU fishing. The aim of this exercise was to identify specific gaps in PSMs adopted by these RFMOs as they compare to the PSMA, and to make clear recommendations on how they could be strengthened. The goal of this research is to offer information that RFMOs could use to strengthen their own port State control systems and, as a result, contribute to enhanced harmonisation of PSMs across tuna fisheries around the world, with the aim of helping to further combat IUU fishing. With the exception of the Indian Ocean Tuna Commission (IOTC), which has adopted a resolution that includes most of the substantive duties of the PSMA, overall the tuna RFMOs do not meet the new international minimum standard set by the PSMA. In particular, they do not have strong PSMs in place and the PSMs that they have adopted are quite fragmented. Our analysis shows the following gaps: ● few requirements to share information between States and RFMOs; ● inadequate designation of ports for entry of foreign vessels; ● poor prior-to-entry information requirements for vessels approaching ports; ● insufficient restrictive measures for IUU fishing vessels, e.g. denial of port services, landing or transshiping; ● generally weak inspection systems; ● limited duties for flag States to cooperate with port State actions. We recognise that IUU fishing on the high seas is a common challenge for all RFMOs and that IUU fishing vessels are not limited to one ocean or RFMO Convention Area. Thus, the more that RFMOs apply a common standard on PSMs, the better able they will be to address this challenge. The comparative analyses undertaken here point to clear steps that RFMOs can take if they want to reach the new international standard provided by the PSMA, and thus make significant progress in combating IUU fishing.